19th century copper oil lamp Brand new wiring. Pair of 19th century French Tole lamps, formerly oil. 19th century Chinese tea tin lamp Brand new wiring. 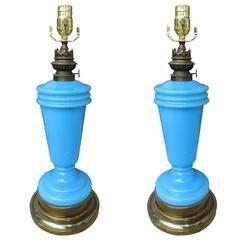 Pair of 19th century French opaline lamps, formerly oil. 19th-20th century neoclassical giltwood Corinthian column lamp Brand new wiring. Wonderful two-color bronze with legend Lizard is associated with the dream time moving upward on the lamp. This original oil lamp have been electrified and fitted with silk lampshades. Pair of Japanese porcelain with bronze doré mounting table lamps. Professionally electrified and fitted with silk lampshades. This 19th century faience table lamp is converted from an old oil lamp. Pair of 19th century French tole table lamps. Each lamp has a different scene. Lamp 27.50" H. wired for US. 19th century Chinese ceramic lamp with applied lizards. On custom wood base. Wired with inline switch. 19th century porcelain and doré bronze oil lamp that has been electrified and fitted with silk lampshade.